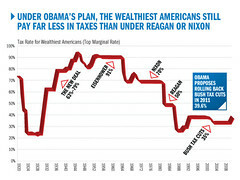 Republicans and the news media are freaking the hell out about Obama's plan for a tax adjustment. It's the end of the world as we know it! He's a socialist! He's bent on redistributing wealth, taking "everything" from the poor, hard-working wealthy. It's going to ruin capitalism, forever! Excuse me if I don't join in the mass hysteria. Don't make me go all Ross Perot with the pointer, people. Look at the graph.